The Global Warming in the Obama Era forum was closed for review on March 13th and is still closed. This is one of the most important topics of our time, or perhaps of human history, so I am starting yet another thread. To avoid having this one closed, let's avoid repeating old denial claims and refutations and concentrate on what is happening in the Obama Era, new scientific papers and reports by science organizations are appropriate subjects for discussion as are new skeptical or denial claims. Barack Obama campaigned with the understanding that he would get serious about the thereat of climate change. Recently he appointed his Enviromental and Energy Team. Obama has continued to appoint strong advocates of energy alternative and proponents of strong actions to limit climate change, most recently Jon Wellinghoff to be Chairman of the Federal Energy Regulatory Commission. President Obama yesterday named Jon Wellinghoff — a lawyer who once served as Nevada’s consumer advocate and a believer that electric-car owners could someday get paid to provide backup battery power to the electricity grid — as chairman of the Federal Energy Regulatory Commission. Are the Obama appointments good choices? Are the Climate Change and Energy Alternative Policies the Obama Administration is developing sufficient? Is the Administration likely to get major Climate Change mitigation legislation passed by this Congress? Joe Romm at Climate Progress posted an ARTICLE today that nicely summarizes much of the scientific articles and reports that have been released since the IPCC's AR4 that covered papers released through 2005. Links to the new literature are provided. By century’s end, extreme temperatures of up to 122°F would threaten most of the central, southern, and western U.S. Even worse, Houston and Washington, DC could experience temperatures exceeding 98°F for some 60 days a year. Much of Arizona would be subjected to temperatures of 105°F or more for 98 days out of the year–14 full weeks. These new studies (some of which I have linked before) explain why I and others have switched over the past few years from debating the science to demanding concerted action. Concern for posterity demands that we all take this issue extremely seriously! With the latest projection I have read saying we will have cooling – not warming for 30 – 50 years one wonders where the nonsense you post comes from. And exactly what “action” would stop this even it were true TedN5? "Despite no global warming in 10 years and recording setting cold in 2007-2008, the Intergovernmental Panel on Climatic Change (IPCC) and computer modelers who believe that CO2 is the cause of global warming still predict the Earth is in store for catastrophic warming in this century. IPCC computer models have predicted global warming of 1° F per decade and 5-6° C (10-11° F) by 2100 (Fig. 1), which would cause global catastrophe with ramifications for human life, natural habitat, energy and water resources, and food production. All of this is predicated on the assumption that global warming is caused by increasing atmospheric CO2 and that CO2 will continue to rise rapidly. However, records of past climate changes suggest an altogether different scenario for the 21st century. Rather than drastic global warming at a rate of 0.5 ° C (1° F) per decade, historic records of past natural cycles suggest global cooling for the first several decades of the 21st century to about 2030, followed by global warming from about 2030 to about 2060, and renewed global cooling from 2060 to 2090 (Easterbrook, D.J., 2005, 2006a, b, 2007, 2008a, ; Easterbrook and Kovanen, 2000, 2001). Climatic fluctuations over the past several hundred years suggest ~30 year climatic cycles of global warming and cooling, on a general rising trend from the Little Ice Age. Global climate changes have been far more intense (12 to 20 times as intense in some cases) than the global warming of the past century, and they took place in as little as 20–100 years. Global warming of the past century (0.8° C) is virtually insignificant when compared to the magnitude of at least 10 global climate changes in the past 15,000 years. None of these sudden global climate changes could possibly have been caused by human CO2 input to the atmosphere because they all took place long before anthropogenic CO2 emissions began. The cause of the ten earlier ‘natural’ climate changes was most likely the same as the cause of global warming from 1977 to 1998." I admit that Romm does a lot of linking to previous articles he has written and primary source links may take some mouse clicking to uncover, but at least they exist - unlike denier sites that constantly reference each other with few links to scientific literature. In rebuttal you offer a retired geology professor whose chief work product was a book entitled Surface Processes and Landforms. Most of his published work was in the 60s and 70s although he did co-author a paper on the Timing and Extent of Allerød and Younger Dryas Age in 2002. Maybe his appearance on the Glenn Becks show makes him an expert? And exactly what â€œactionâ€� would stop this even it were true TedN5? Nothing could stop it, it is too late, but it can be held to tolerable limits. Did you look at the Hadley chart in The Article? There is one huge difference between a world where average temperatures by 2100 have increased 2.1 to 2.8 degrees C and one in which they have climbed 5.5 to 7.1 degrees C.
Yes and this data is only good if you buy the forceing effect of CO2 and believe that it is the primary driver of global climate. Clearly this is not the case or DUH, we would not be looking at decades of cooling as CO2 output rises. So what will happen is at some point someone will say that it seems the degree of “forcing” by CO2 of water vapor has been overstated and they will essentially agree with the man you just blow off above. And who is Dr. Pope – a economist? Not a climate expert. How do you know we can hold it to anything sir??? Show me where this is predicted in a model. Show me that after we spend Trillions of $$$$ we sure as hell don’t have and lose millions of jobs that it will be worth it. Let me say this again so you can try to rebut. NO MODEL predicted the upcoming decades of cooling no predicted. Thus the theory that bigger climate factors than CO2 are at play here is, to me, very credible. This is referred to as the "David Irving" model of debate, named after his infamous holocaust denial argument, daring anyone to produce a signed document authorising the holocaust. First you take a fictional point not supported by legitimate science and rejected by the vast, overwhelming majority of the world's scientific community, and present it as if it were fact: in this case your so called 'global cooling'. Then, discredit those same vast majority of mainstream scientists because their models did not predict the bit of fiction you have just presented as fact. Sure enough, the 'fact' is just a conspiracy theory you and tiny (and decreaing) number of conspiracy theorists have bought into, because you neither care to read nor want to understand the MASSES of scientific data proving you wrong. Thus, since it doesn't exist, of course none of vast overwhelming majority of the world's mainstream scientists 'predicted' it. It is a dishonest tactic not in any way condusive to honest debate, which is probably why it was employed by a holocaust denier. It is also against two of the principles of the Survival guide: logical fallacies and Blanket statements. Might I humbly suggest you consult the AD survival guide, to help you not make such errors in the future. Post squat – attack the other poster. “No more than anecdotal evidence, to be sure. But now, that evidence has been supplanted by hard scientific fact. All four major global temperature tracking outlets (Hadley, NASA's GISS, UAH, RSS) have released updated data. All show that over the past year, global temperatures have dropped precipitously. A compiled list of all the sources can be seen here. The total amount of cooling ranges from 0.65C up to 0.75C -- a value large enough to wipe out most of the warming recorded over the past 100 years. All in one year's time. For all four sources, it's the single fastest temperature change ever recorded, either up or down. Asking for verification of someone's assertions of fact is not "attacking the poster." People who post assertions of fact have the responsibility of verifying them if challenged. Challengers of unsubstantiated assertions do not have the responsibility of disproving them. Then post proof that my source is wrong sir. “Warming ocean water around Antarctica, by a maybe 2 to 5 degrees Celsius, could trigger that chain of events, Pollard says. That degree of ocean warming is not forecast for this century, but at the rate the planet is heating up, it seems inevitable at some point. But Pollard's study indicates that the West Antarctic ice sheet won't melt away too rapidly. He figures that will take at least 1,000 years, and more likely 2,000 to 3,000 years. "Before there was only a vague idea of how the West Antarctic ice sheet grew and decayed over those time scales," he says. Now, a scientific drilling project has brought back sediment samples taken from underneath the ice sheet, allowing scientists to study the mud layers, like so many tree rings, to show what ice there has done over history. "It's really exciting," Pollard says. "They've shown it really has collapsed and re-grown, multiple times." Are the Climate Change and Energy Alternative Policies the Obama Administration is developing sufficient? Sufficient to... stop global warming? Absolutely not. If global warming is a result of human action as the media so happily portrays, then it's already too late. If not, then it's a waste of time. Sufficient to improve the economy? The potential is there. backed into a corner, play the martyr card. pretend you are the boor beset victim of terrible abuse, even though the thread is pretty clear that this is not the case. In fact I went out of my way to be polite to you Ted, but that doesnt matter to you of course. You also play the hilariously ironic card (your only other one) of accusing others of the exact form of debating you subscribe to. In polite society ted, that is called lying. You do this every time. At this point, it has become the best way to debate you is simply watch you panic, use oyur dishonest tactics and have everyone laugh at you. I could easily point out that, in fact NONE of the organizations quoted in the quote from your denyier webside actually agree with the comment he is making. That right there is enough to utterly discredit him. I could also point out that, EVEN IF those claims were true, a slight cooldown of one year means nothing, in fact it happens quite frequently. I could FURTHER point out the startling hypocricy from you and your fellow tinfoil-hat-wearers, that you refused to accept a decade of global warming as a 'pattern', but somehow a single year of a slight temperature drop IS. The first is point out that the tiny drop in the temperatures during 2008 (and only related to 2007, 2008 was still well above the average for the last 50 years) was not only well understood, but in fact expected. Thats right, if you read anything other than fanatic denier webpages, you might stumble across some actrual science. Here are two seperate posts from january 2008, predicting exactly what would happen in 2008 and why, and they were absolutely right. There you go, the anticipated and fully understood short-term one-to-two year reason why the overal weather was a tiny bit colder than the year before. Sorry Ted. Mind you, given your track record you wont even open the links, so I'm not sure what good it will serve. The hilarious thing is your tiresome ranting about ho 'Nobody predicted this'!!! When in fact EVERBODY predicted this Ted, you just didnt bother to actually look it up for yourself and decided to make a comment up based on nothing. Well, here you are again, exposed as completely factually false. I said I was going to do two things. The second is to do what almost everyone else on thois board has already done, and what I get an inbox full of emails recommending I do: completely ignore you. Your tactics are as destructive to honest debate as they are predictable, and I dont want to be even tangentially involved in bringing down any more threads. I am also going to publicly recommend that all debators on this forum who agree with me, refuse to answer Ted's posts EVER unless he starts engaging in honest debate. Just a suggestion of course. I am tired of butting my head against this wall. You may have the last word here, use it wisely. Frankly I found the chart offered and explained by Prof. Easterbrook confusing on two levels. Here's the chart taken from the link above. First he presents a glacial ice level that's fluctuating in the North Cascades over time. This has to do with squat. He is relating glacial patterns in one small section of the earth to the entire earth warming/cooling pattern which is apples and oranges(However even if you buy the legitimacy of the comparison it clearly doesn't work). Earth wide ice charts show glacial ice decreasing almost uniformly year after year. Then he compares the Pacific Decadal Oscillation(PDO) with the progression of the earth's temperature over the last 100 years, presumably to declare PDO as a principal temperature forcing. For one thing the warming and cooling periods coordinate only very crudely. For another the PDO shows little in the way of change in the general temperature trend line, unlike the long term upward trend of the air temperature. 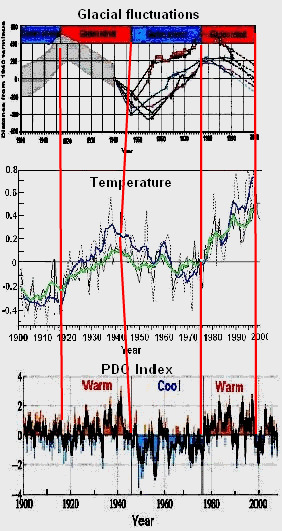 In fact the PDO temperature appeared higher in 1900 than iin 2000. Maybe he has some kind of point but it appears to be gobbledygook to me. I am also going to publicly recommend that all debators on this forum who agree with me, refuse to answer Ted's posts EVER unless he starts engaging in hnst debate. Just a suggestion of course. Your senseless rant is getting tiring to a lot of people. How about this – YOU stop responding with this drivel directed at me. Now for others go here for a very enlightening presentation. Click on the Power Point presentation – it is worth review. I will forgive you for not bothering to address the fact that you have been just proven factually wrong (again), because I was adding more evidence to my post via an edit even as you were typing. I expect now you will go back, see that everything you have claimed here has been proven utterly factually wrong, and apologize. Actually, I dont expect thats what you will do at all, thats just what someone interested in honest debate would do. So my apologies, I just wanted to point out the mid-edit issue, but you may now dominate the thread with your usual tactics. Oh and the false appeal to authority is pretty lame as well Ted. You know very well you have no supporters here. Anyways, I broke my own rules, and my bad. Feel free to deal with the FACTS presented above, or not as usual. Your call. Well Ted believes what the voices tell him. He does provide some interesting counterpoint at times. When he trots out some of his "experts" it helps remind me that even at the level of PHDs the break down in rational thought process and respect for evidence is more pervasive than I might expect. Ted, even when you cite a reasonable source you quote it selectively to make a point different from the authors. â€œWarming ocean water around Antarctica, by a maybe 2 to 5 degrees Celsius, could trigger that chain of events, Pollard says. That degree of ocean warming is not forecast for this century, but at the rate the planet is heating up, it seems inevitable at some point. But Pollard's study indicates that the West Antarctic ice sheet won't melt away too rapidly. He figures that will take at least 1,000 years, and more likely 2,000 to 3,000 years. But instead of being reassured by this long time horizon, Pollard says, "I'd say I feel more nervous." That's because there's now a clear history showing this massive ice sheet has melted before, under conditions that the Earth may soon experience. And while the full effect may not unfold for thousands of years, it would transform the planet into a place we would not recognize today. "We certainly don't need a collapse of the ice sheet to cause major problems with sea level rise," he says. Even if Antarctica contributes little or no water to the oceans this century, Rahmstorf says, there's a growing consensus that seas are likely to rise by at least two or three feet — and quite possibly more — before the end of this century "unless of course we stop the global warming fairly soon." This is difficult advice to follow. Let's just keep our responses short and make sure he doesn't high jack the forum again. A clear history that this has happened before..... What caused it then, TedN5? Cavemen driving their Flintstone SUVs? Or, is it simply the way the Earth works? Our climate is a dynamic system, always has been and always will be. Thousands of years ago, we wouldn't recognize it the way it is today. Is it not reasonable to expect that thousands of years from now it will also be different from today? It seems to me that we would be better served by figuring out how to adapt to climate changes that are going to happen because that's what the Earth does rather than taking the arrogant position that we can really stop that change. It's going to happen even if we return to the caveman days as some apparently would suggest. Doing that would make us less capable of adapting I think. Did you know there is a technology to re-cycle CO2? A process where CO2 can be turned into Carbon Monoxide which can then be turned into hydrocarbons? Did you know that? Well there is and it's been demonstrated by Sandia Labs. Here is an article about it. Now, it's in its infancy, and it would be expensive, but it does seem to me a better use of our resources than just simply taxing the hell out of people for using energy. So tell me why I should be concerned here? Obviously this change in ice sheet has nothing to do with CO2. And lets, just for fun, do the math here TedN5. Lest say sheet melts in 2,000 years and causes a 25 foot rise in sea level. So what is the rate of rise? Well sir that .15 INCHES per year. I'd say 15 inches rise every 100 years only from the ice sheet is quite massive, particularly when you realize most of the melting is coming from the northern hemisphere. And that in no way assures that it won't be considerably higher. We're into a Russian roulette game. And because the ice sheet has melted before, the melting has nothing to do with CO2? How did you arrive at that interesting piece of logic? You also totally misinterpreted the interview! Pollard wasn't referring to the coming and going of ice ages when he said "under conditions that the Earth may soon experience" but the climate being created by human generated greenhouse gases. Consider THIS Alternative Report on the same study. This is also the expected time scale of future collapse of the West Antarctic ice sheet if ocean temperatures warm sufficiently – longer than a few centuries but shorter than ten thousand years. The researchers note that when atmospheric carbon dioxide levels in the past were about 400 parts per million, in the early part of the ANDRILL record, West Antarctic ice sheet collapses were much more frequent.. "We are a little below 400 parts per million now and heading higher," says Pollard. "One of the next steps is to determine if human activity will make it warm enough to start the collapse." To be sure, a total collapse would take a long time but Antarctica is already losing mass (see HERE) and contributing to a global rise in sea level. However, as Dingo pointed out, the 5 foot rise by 2100 projected in the article I linked is not dependent on a major contribution from Antarctica. Rather it projects the melting of continental glaciers, increased melting of and speed up of Greenland glacier discharge, and the thermal expansion of the oceans as temperatures increase. What Pollard's study reveals is that sea level rise could continue for thousands of years beyond 2100. All climate scientists who are convinced that AGW is underway are aware of past climate cycles. (Read some of THESE Book Reviews). That is part of reason why they are so concerned about the stability of the current climate. The common explanations for the coming and going of ice ages are well known being usually attributed to changes in the Earth's axis of rotation in relationship to the sun and slight changes in its orbit around the sun coupled with positive (or negative) feedbacks from increases (or decreases) of Carbon Dioxide in the atmosphere. (There may be other reinforcing feedbacks as well). Yes, I am aware of the CO2 capture and conversion suggestions. I hope the technology is successful but it would only be a drop in the bucket compared to what is being released. It occurs to me also that, if the product was used as fuel, it would only at best be GHG neutral and would possibly be negative depending on the carbon impact of the energy used to drive the conversion.